Arriving early, the camp was set up before members of the public arrived and started to ask questions, take a look at the weapons and armour and have a go at wielding a pike and musket themselves using our dummy weapons. The regiment had a great time. There were plenty of public to meet and we had a great time showing them all of the weapons and armour, letting them try it on and giving it a go with the dummy weapons, giving them an opportunity to test out being our next Pikemen or Musketeers. It was a great opportunity for us and we had a great day, so thank you to Wakefield Armed Forces Day for letting us come along again. It’s no rest for the wicked here as we’re rather busy both online and on the field over the next few days. Firstly, our next event is coming up in just a few days. You’ll find us at the Queen’s Sconce in Newark, Nottinghamshire for a large event with the rest of the Sealed Knot this weekend. From 10:30 am on both Saturday and Sunday, there will be a Living History camp to explore, including a range of cameos and the opportunity to take a closer look at the weapons, armour and other equipment of the 17th Century. 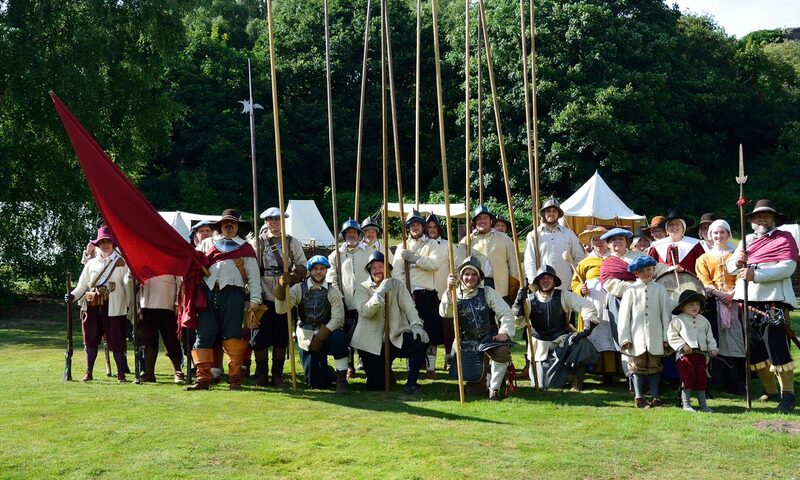 There will be a range of people in the camp, not just soldiers, ready to answer your questions and tell you all about life in the 17th Century, both the nice and the not so nice parts! They’ll also be able to show the similarities and differences between life now and life during the wars. As well as this, there will be displays of arms from both the soldiers and our younger apprentices, before battle commences at 2pm. The event is completely free to attend, so if you’re in the Nottinghamshire area and looking for something to do, we highly recommend coming along and seeing what it’s all about. It’s 375 years since the first Siege of Newark, so the battle is marking this important anniversary and the start of Newark’s turmoil during the following 3 years. Finally, we have something exciting happening all over our Social Media channels over the next 10 or so days. On the 30th June this year, it will be the 375th Anniversary of the Battle of Adwalton Moor. This battle was in important and strategic one for the Marquess of Newcastle and his regiment, so we feel it’s important to tell it’s story. Starting today and continuing on until a few days after the battle, our Facebook, Instagram and Twitter will be playing out all the action as it happened, so please head over to our pages and follow along! Keep an eye out for updates on here next week too. Don’t forget, we’re always looking for new people to come and join this fantastic hobby. If you’re reading this thinking ‘how do I have a go? !’ head to the Joining Us page and you’ll find all the info you need about getting started. Weekends start from just £10 and all 17th Century kit is included! Photos by Suzanne Bingham, Rusty Aldwinckle and Paul Kneller.